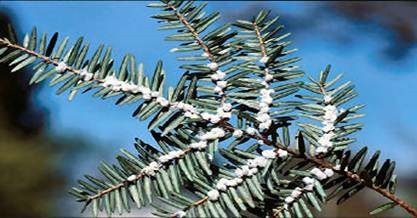 Warren, Pa. – The Pennsylvania Department of Conservation and Natural Resources (DCNR) and United States Forest Service (US Forest Service) are organizing a workshop aimed at training volunteers to identify and report new hemlock woolly adelgid (Adelges tsugae) infestations in northwestern Pennsylvania. The workshop will be held on Monday, May 6, from 11:00 am – 3:00 pm at the Cook Forest Sawmill Center for the Arts, located at Cook Forest State Park and will feature presentations by Dale Luthringer of DCNR about the Cook Forest infestation and some of the specific old-growth hemlock trees at risk, and by US Forest Service entomologist Rick Turcotte on the adelgid’s biology and the threat it poses to local hemlock forests. Participants will observe hemlock woolly adelgids first-hand and gain experience in detection, monitoring, and reporting protocols. Participants will also have the opportunity to volunteer in the “Adopt-a-Hemlock” program to conduct surveys and report new infestations in local hemlock forests. Participants are asked to dress for the outdoors and to bring lunch and water for the afternoon. This newly arrived invasive insect pest threatens eastern hemlock trees and the biodiversity they support in these state parks and on nearby lands such as the Allegheny National Forest and Pennsylvania State Forests and State Game Lands. This insect causes a cascade of environmental changes for some wildlife, fish, invertebrates, and plants in response to the increased light and warmer temperatures. This destructive insect, introduced from Asia, was recently detected in Cook Forest and Clear Creek State Parks. Home to the most significant Eastern hemlock stand north of the Smoky Mountains, Cook Forest State Park is famous for its old-growth trees. Its “Forest Cathedral” of towering hemlock and white pine is a National Natural Landmark. DCNR is partnering with the US Forest Service, The Nature Conservancy and other interested organizations to develop an Eastern hemlock management plan for northwestern Pennsylvania. In addition, its Bureau of Forestry is drafting a hemlock conservation plan for Pennsylvania. Early detection of new sites is a high priority, and organizing volunteer surveys as a critical first step in managing this destructive invasive species in northwestern Pennsylvania and on the Allegheny Plateau. Most of northwestern Pennsylvania remains the only part of the state that does not have known hemlock woolly adelgid infestations.